Given that I only spend a couple of weeks a year in San Francisco nowadays, I don’t return to restaurants as much as I’d like, opting instead to try as many new places as I can. 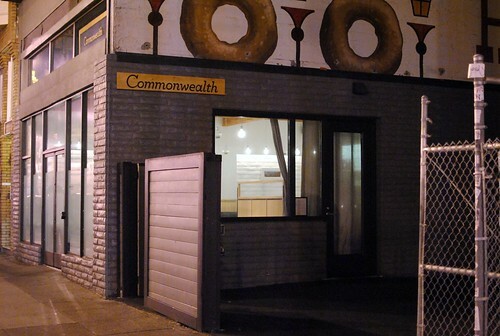 I thoroughly enjoyed my meal at Commonwealth last December…so much that I wanted to make a return trip during the Thanksgiving weekend. Opentable was not on my side having only a 5:30 reservation available, but I must’ve checked that site dozens of times during the course of the week and stumbled upon a 9pm slot (seats at the bar are available on a first-come basis, though). The timing would be perfect; it was just enough time to see USC take a 29-0 lead over UCLA at halftime. 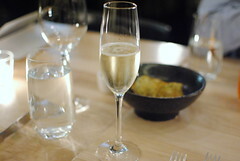 Commonwealth offers an a la carte menu of plates ranging from $6 to $16 as well as a 6 course tasting at $65. It’s a great value, made even more impressive by the fact that $10 from each tasting menu goes straight to a local charity (currently, it’s Mission Graduates). 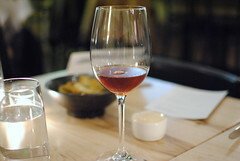 Additionally, the restaurant was willing to add any a la carte items to our tasting, splitting it evenly into three equal portions at no extra charge. Effectively, extra courses were at most $5pp – awesome. We opted to tack on three extra courses to our tasting (it amounted to $77pp), and the kitchen was kind enough to add an additional one on the house. This was a fun soda. Star anise was definitely front and center, but there was a subtle pear flavor as well. More exciting than a typical bread basket, these were tasty and addicting. The seaweed flavor was fairly subtle but you knew it was there, and each bite had a wonderful crunch. This was one of the a la carte dishes. Basically meatballs, the chicken was moist (dry chicken meatballs are the worst! ), and I tasted a little bit of lemon essence and spiciness. The rice cracker added some delicate texture. A nice start, for sure. The kitchen then brought out two amuse bouche. The bite of geoduck was chewy, slightly fishy and smoky. The soup was very comforting with warm, earthy flavors and a lingering sweetness. 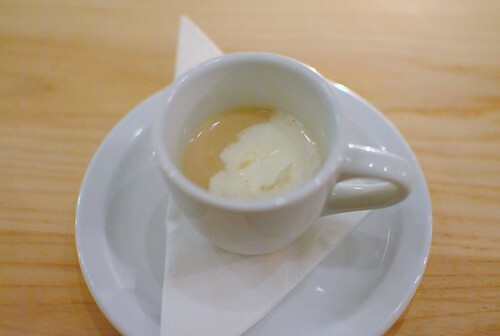 A little bit of creme fraiche countered with a tart flavor that also added some richness. Amazing. 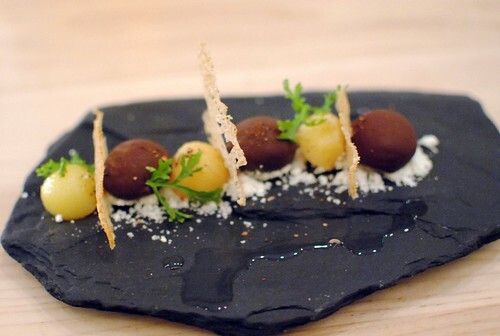 The creamy foie gras was encapsulated in a shell of hardened chocolate. 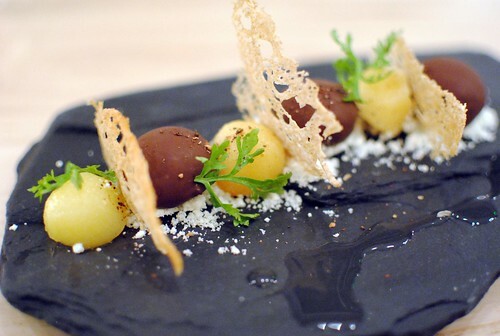 I thought this was a great combination of flavors and textures, totally resembling one of my favorite desserts. 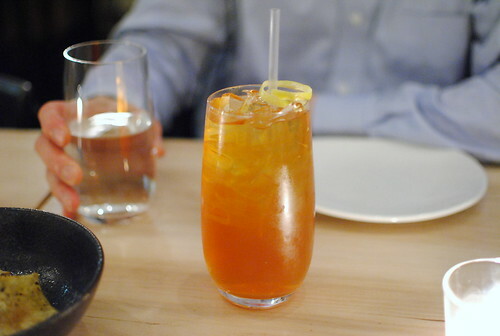 The quince was a nice touch as well with a refreshing, complementary sweetness. 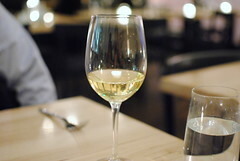 The grenache blanc pairing was one of the best I’ve had in recent memory. 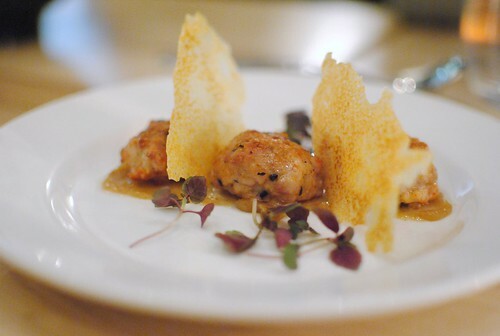 The artichoke was prepared in two ways, a creamy heart portion and a fried, crispy portion. I thought both of these were tasty, while quinoa added some extra body and earthy tones. 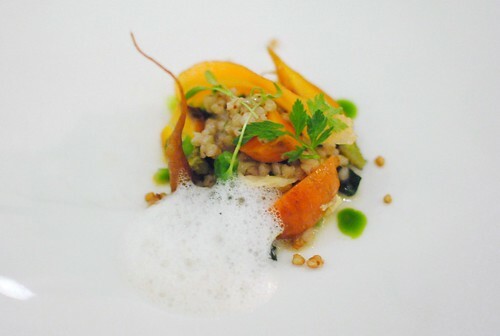 Texturally, this dish really intrigued. 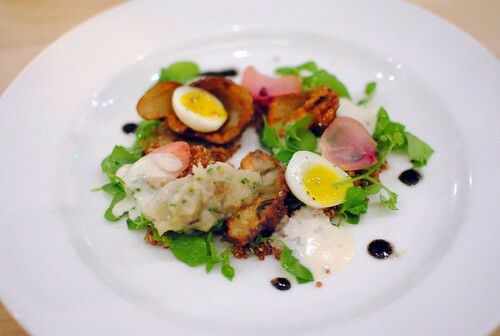 The quail egg was fun, providing a little more richness. 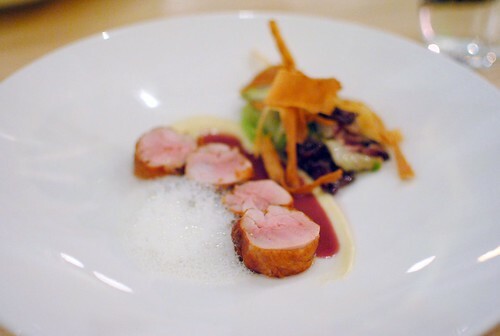 This dish had a lot of components that really came together. 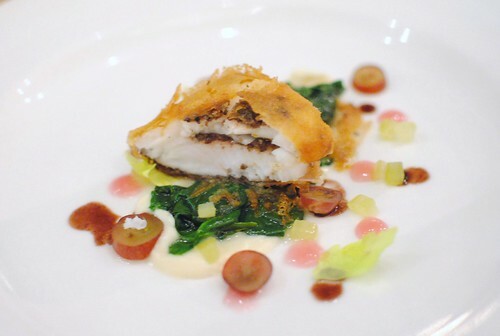 This dish (from the a la carte menu) was compliments of the kitchen. The carrots were clearly spotlighted, crunchy and sweet. 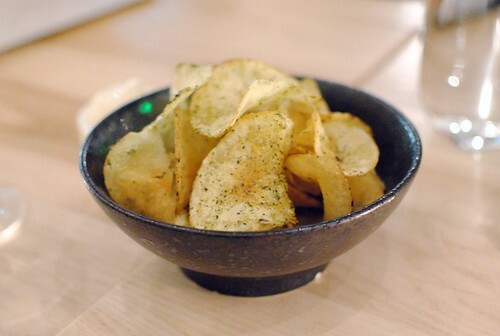 I liked the extra texture of the crispy puffed buckwheat and I’ve been loving yuba lately. 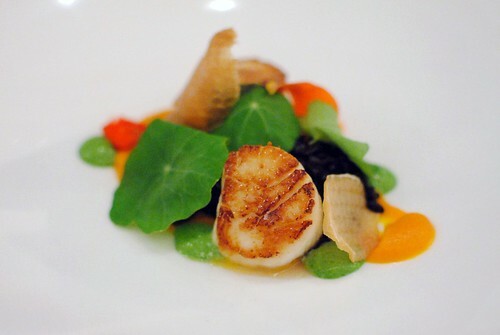 Again a duo of preparations for the main ingredient: a seared scallop was paired with dehydrated slivers. Interesting. The scallop was good, nicely seared, and I liked it in tandem with the sweet and creamy pumpkin. The black rice added some extra body while the dehydrated scallop was a nice touch – it tasted of the sea but had a chewy, almost leathery texture. Fun, but I probably won’t be craving a whole bag of them. Colorful presentation. 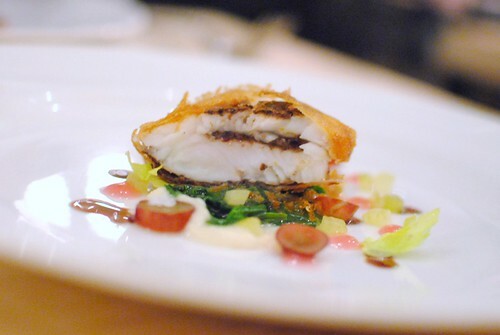 I thought the fish was cooked well here, and the feuille de brik wrapping provided a very delicate texture (almost resembling crispy fish skin). I thought the olive filling may have been slightly overpowering though, as the fish’s flavor was pretty mild. I wasn’t sure I was going to, but I enjoyed the celery, grape and spinach flavors here. I thought the quail had good flavor, tender and cooked well. Also, I liked the sweetness of the vanilla and parsnip in tandem with the bitter fig leaves. My dad thought the meat was slightly overdone though, and I did think one of my four roulades fell into this category (the other three were perfect). He also found a few pieces of bone/cartilage within his meat…yikes. 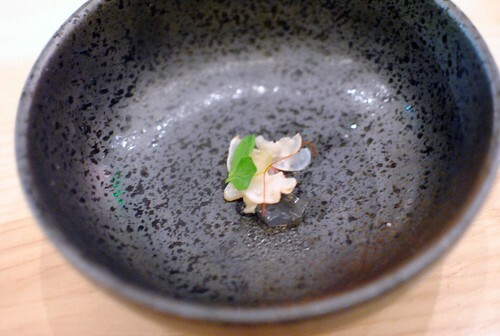 Disconcertingly, I’ve been finding bones/shells in a surprising number of higher-end meals in SF lately (ahem Benu, Coi) and it’s just not fun. This was our last savory course and another from the a la carte menu. The meat was expectantly very tender, and the coffee rub definitely came through, adding some depth. 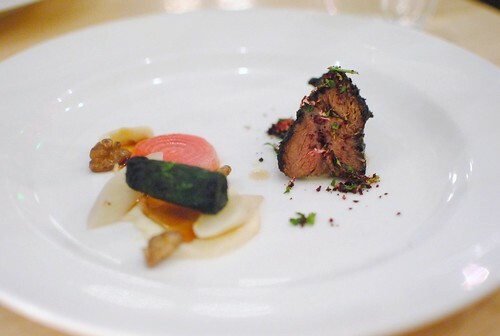 I didn’t think the salsify and beets were able to stand up to the richness of the beef and coffee flavors, but I didn’t mind too much. 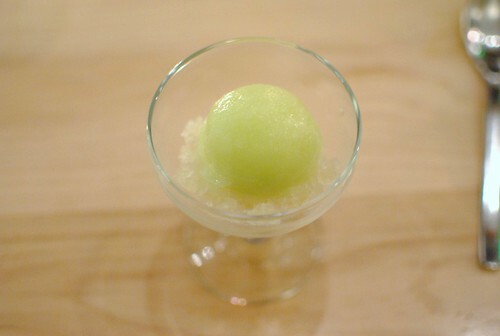 The sorbet was as advertised; the flavor of green apple was bright and clear. The slightly sweet, slightly herbal granita was a nice touch. The peanut butter flavor was clearly upfront, and I enjoyed it with the chocolate and butterscotch. Classic flavor combinations. The frozen popcorn was interesting but I didn’t think it added much flavor. Lastly, we were served one more thing. 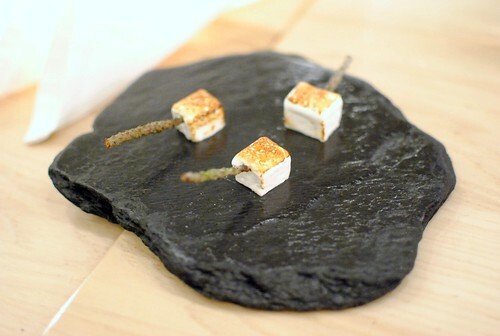 A marshmallow was caramelized and poked with a twig, and a pine essence really came through. How seasonal! The wine pairing was very reasonable at 5 pours for $30. 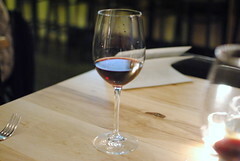 The restaurant even refilled the glass a number of times for our supplemental courses. 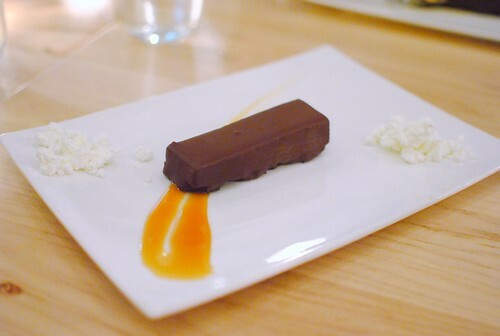 Of the pairings, the grenache blanc was easily my favorite, paired with the chocolate and creamy foie gras. My meal at Commonwealth was both interesting and delicious. In fact, it was one of the more interesting meals I’d had in some time. For some reason, I can’t think of anywhere in LA that has the same combination of such refined dining in a very casual atmosphere. I liked the way that chef Jason Fox would take the central ingredient and often prepare it in multiple ways on the plate. 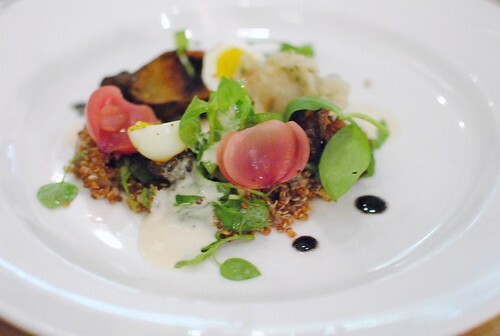 Accompaniments were well thought-out but never took away from the focus of the dish. This was quite possibly my favorite sub-$100 meal of the year. Now, why doesn’t this restaurant have a Michelin star? Service was very attentive; silverware was changed and the entire table wiped down after every single course – twelve times. Even when I’m pretty sure it didn’t need it. The French Laundry didn’t even do that.